ST. LOUIS, Mo. — Students at a public high school in Missouri walked out of class Monday in protest of a male student who is being allowed to use the girls’ locker and restrooms. According to reports, approximately 150 students at Hillsboro High School spent two hours expressing concerns over the permissions granted to a 17-year-old senior who identifies as “Lila Perry.” Perry, born a male, says that he began having female inclinations at age 13. He had been living as a homosexual male up until last year, when he donned a wig and female clothing. School officials recently gave Perry permission to use the girls’ restroom as he had heretofore been using a faculty unisex restroom. He also had utilized the girls’ locker room for gym class, but dropped out of physical education when it upset some of the girls who had to change their clothing with Perry present. Last week, a school board meeting that included discussion about Perry had to be moved to a larger location to accommodate the many parents who came to express their opinion abut the issue. “The girls have rights, and they shouldn’t have to share a bathroom with a boy,” parent Tammy Sorden told the St. Louis Post-Dispatch. Attorney Derrick Good, who has two daughters attending Hillsboro High School, has been working with the legal group Alliance Defending Freedom (ADF) to craft a district policy that would require students and faculty to use the restroom that correlates with their birth gender. Perry told reporters that he thinks the concerns are unfounded. Following the meeting on Thursday, approximately 150 students walked out of class on Monday until they were told to go back inside two hours later. Most were opposed to Perry’s use of female facilities, but an estimated 30-40 additional students held a counter-protest in support. 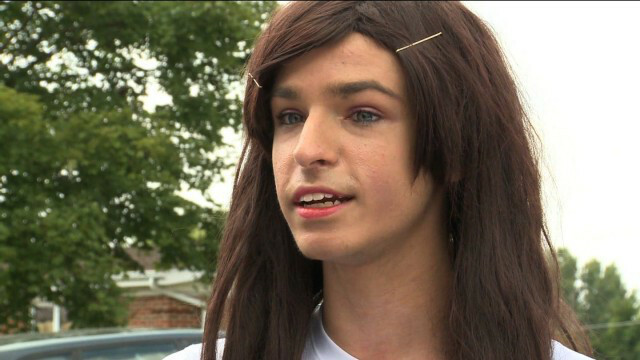 “Putting on a dress and putting on a wig is not transgender to me,” student Sophie Beel told Fox2. “There’s a lot of ignorance, [and] they are claiming that they’re uncomfortable. I don’t believe for a second that they are. I think this is pure and simple bigotry,” Perry said.